The hawk owl is a non-migratory bird that generally resides in its breeding range with rare southward irruptions. These owls are different from other owls in the sense that they are diurnal and hunt for prey in the course of the day giving them the nickname day owl. 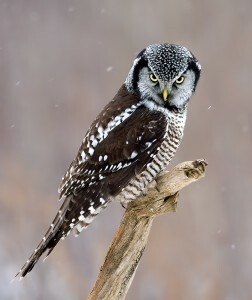 Hawk owls are so called as they resemble falcons more than owls. 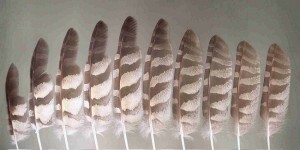 Their habits and behavior are similar to those of the smaller hawks giving rise to its name. 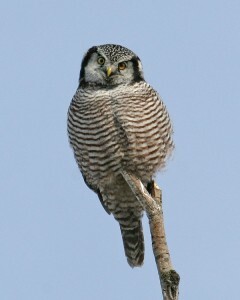 Their flight is similar to that of accipiter hawks on account of their long tails and pointed wings. They have a noisy flight compared to nocturnal owls due to their stiffer feathers. These birds are very common in open coniferous forests and deciduous foliage like birch, willow, larch and poplar. 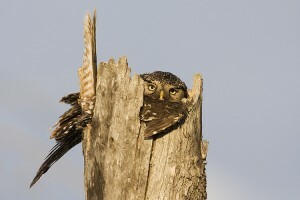 Apart from the daytime, the owl is also active at dawn and dusk. It has the habit of perching on trees to locate prey on the ground, and then it moves in for the kill with very high speeds. 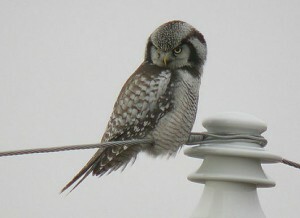 These birds are extremely search oriented and do not spend much time in an area that is not showing up any prey. Like most other raptors, they perch on tree branches to locate prey, flying in for the kill once they set their target. The breeding season for these owls starts in the beginning of spring usually in March. The male lays the foundation for a nest territory and begins attracting females using its calls and flight displays. If a female is interested in the male, the couple fortifies their intimacy, making cheerful calls, rubbing their beaks and display of plumage. Before the onset of the mating rituals, the male stores food around the nest and offers the female with prey. 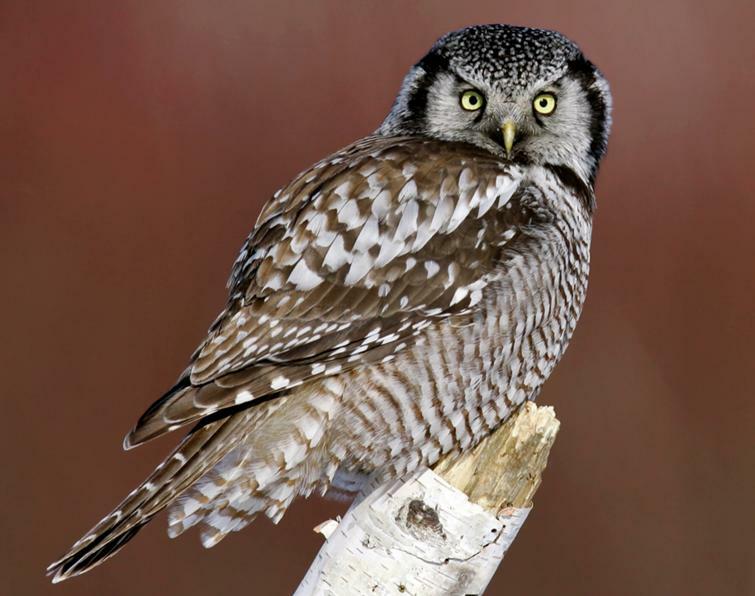 In case there is a dearth of food supply, hawk owls may not breed at all. The nests of these birds are mostly found in hollow trunks and cavities of worn out trees. Some owls are loyal to their old nest sites and prefer to use them again and again; however, this is more of a rarity with most owls going for new nests. After the end of the process of nest building, the female lays a clutch of around three to seven eggs during the months of April and the beginning of May. The process of incubation is mostly carried out by the female and lasts for 25 to 30 days. After hatching, the female also takes care of the babies for another 10 to 14 days. During this critical juncture, the male is the only hunter and it provides food to the female as well as the immature nestlings. The juvenile birds are ready to leave their maternal abode when they have completed three weeks of age. They are not able to make long flights but can fly for short distances. These growing fledglings stay close to the nest site for the following three to five weeks. They receive nutrition as well as protection from their parents till they become fully independent at the age of around two and a half to three months. The juvenile birds are believed to become ready for breeding on completion of one year of age. 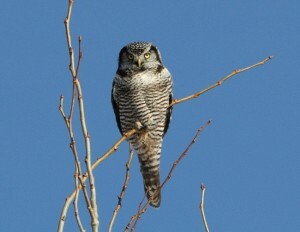 The hawk owl has very powerful eyesight and can locate prey from a long distance of around 800m. 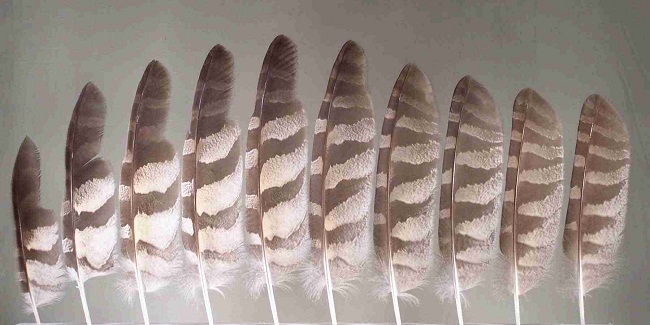 The wings of this owl are shaped in such a way that they help them in hovering in the sky like kestrels, aiding in hunting. 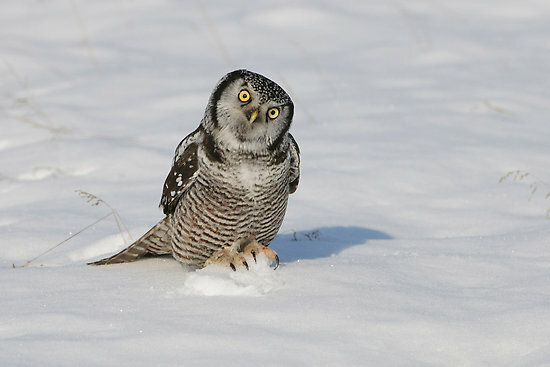 They sometimes catch birds in the middle of their flights and can catch rodents hidden under the snow with their ability to detect movements only by sound. 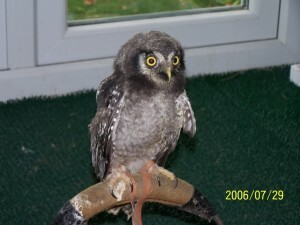 These owls are also called as earless owls because they do not have real ear tufts. They have a tame nature and may allow humans to approach it without any hesitation. 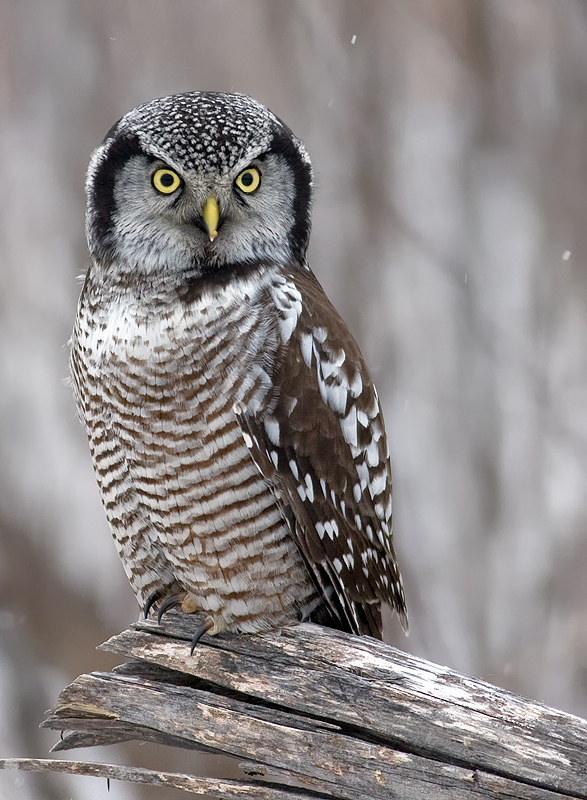 The Northern pygmy owl is the closest relative of the hawk owl. This is the only living species in the genus Surnia and family Strigidae. Greetings between a paired couple are a soft uih or ugh. The hawk owl is recognized as a bird of falconry in Ontario and can be utilized to hunt game, but only with proper license. Published on August 5th 2015 by admin under Coniferous Forest Animals.